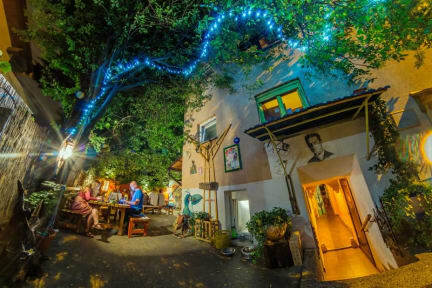 Hostel Mali Mrak Zagreb kohteessa Zagreb, Kroatia: Varaa nyt! Important Note: we don’t host binge drinkers and other complicated lifestyles. We run this nice place so we can meet the good travellers of this World. People who are sour and/or spoiled, always complaining (yes, you know if you are one of those :)) please don’t come here, we really don't want you, thanks. · This house is the home of Fenris, a unique dog and mastermind. • The house features 3 kitchens, one of them a huge outdoors kitchen located in our vibrant, green garden. You can even cook there while it’s raining. • If you're visiting in late summer/early autumn, the garden is giving an abundance of grapes - you're free to pick them as you sit, as they literally grow over our heads. The House itself is organic, cosy, and full of details, we do everything local and handmade, with lovely clean dorms that are constantly upgraded and decorated, you won’t see mass produced boutique crap here. About us: We handle things in an honest and spontaneous way, the sense of community has high value here and as long as you respect the house and the people in and around it, you’re considered part of the fold and you’ll have all our knowledge, resources and experience at your disposal. Common sense and efficient solutions are favoured here and if you appreciate such things then you’re welcome to hop aboard. - Bike tours, Zagreb has great areas for that and we have really nice routes in store. - More, but it’s a secret. - Ambience plays a huge role here (a collection of 50+ lamps graces the house). - Since we support artists (residencies available, ask! ), don’t be surprised if you stumble upon the occasional concert, a jazz school of singers or a poetry evening. - The longest stay at the house was 3 years, the shortest 5 minutes. - You can rent bikes, and if you’re staying longer (4+ days) they’re free. - We offer really good prices for travellers who wish to stay longer in Zagreb, especially in off season. Ask! Location: Read the directions here on Hostelworld on how to find us, they’re easy and precise. We are not central if that's a thing for you. We prefer to stay outside the tourist zone and yet have quick access to the city centre - we're located in an ordinary, safe neighbourhood and Zagreb has an excellent, 24/7 public transportation system that connects you directly from the hostel to everywhere else, you’ll need 15 min by tram to the centre. Make sure you buy the cheaper tram tickets (4 kn or 0.5€, inside the tram @driver), it's very affordable and actually a cool thing to support public. Closest hiking spot is 15 minutes from the hostel on foot, but Zagreb has many other locations as well, we can help with that. 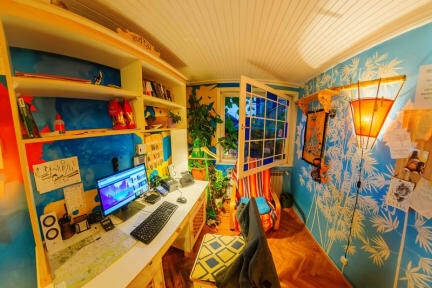 For those who are traveling on a budget and have certain skills- if you can and feel like it, feel free to contribute / upgrade the house in a specific way - we love that (you’ll notice a ton of stuff people have done here) - create something and in return you can get a discount, free food and/or stay. You certainly wouldn't be the first, and we are known to support travellers in many more ways than just giving convenient bed prices. Contact us via email for details on that. The City Tax (10 kn per person per night ) is NOT included in the room price you book online. We have to charge it in any case, and since many wonder what that is, here goes: it's not something any hostel makes up, it's just that - a city tax that goes to the state of Croatia, a way for the state to make money. We must charge it, and keep it separately because of account keeping, so we rather choose not to incorporate it into the bed price (that means: raising that same price for said amount and proclaim 'no additional tax') and charge it separately and show it on your bill.